Today I had the chance, alongside Cesar, the other LHIP intern, to take out 20 latinos out into the swamp. 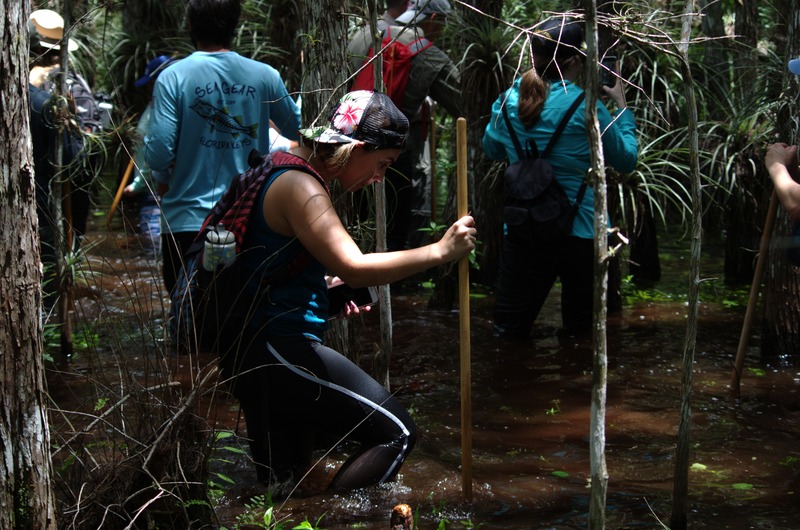 As an intern with the Latino Heritage Internship Program, we were tasked with creating some sort of event or program to help bring out Latinos into National Parks, ours being the Everglades. We decided that hosting an event would be the best idea. I started with maybe hosting a night bike right through Shark Valley’s tram trail during the sunset…but that was kind of boring and something everyone does anyway. My second idea was a slough slog! Earlier in the summer, I was able to go on a slough slog with my boss and the rest of the interns as part of our orientation of the park. Some of you might be thinking “What in the world is a slough slog?” Well…it’s the best way to experience the Everglades, in my opinion. It’s essentially a wet hike, but it’s not just a wet hike out into the sawgrass prairie. 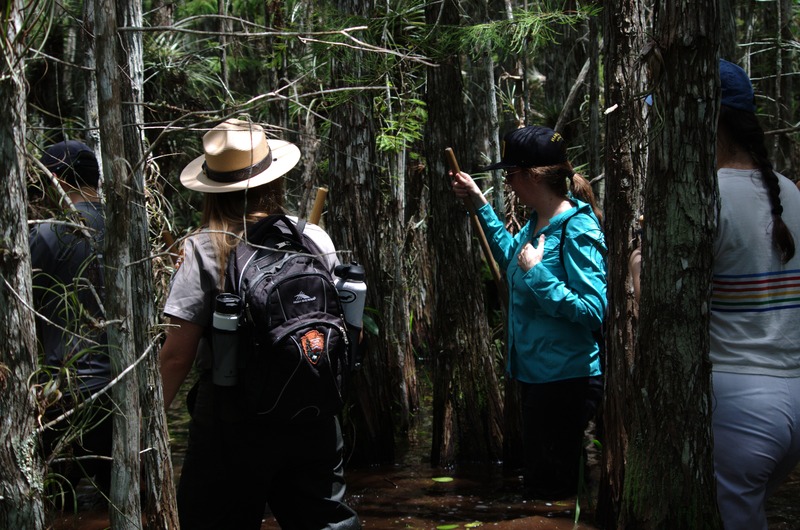 It’s a wet hike in waist deep water (my waist deep…I’m 5′ 2″) through a cypress dome. Cypress domes are the coolest things ever. They are composed of cypress trees. They’re super skinny trees with giant bottom trunks. They like to grow in disturbed areas with a lower elevation than hardwood hammocks. 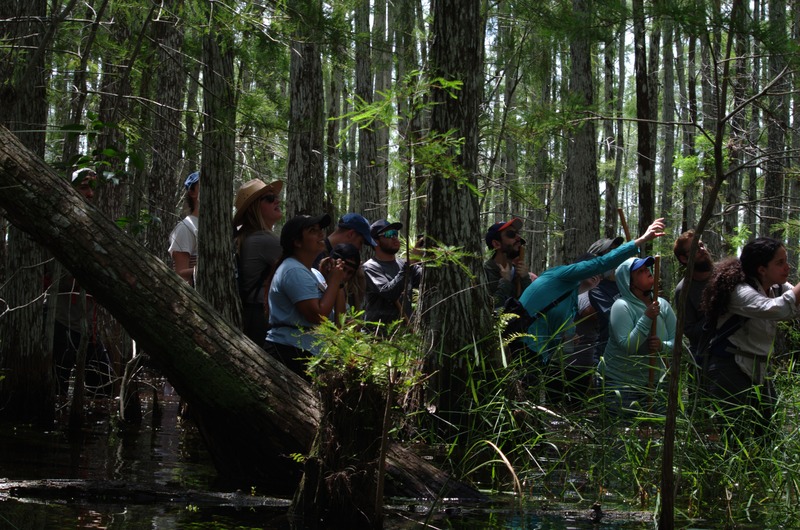 Usually, in a cypress dome, there is an alligator hole where it all started. 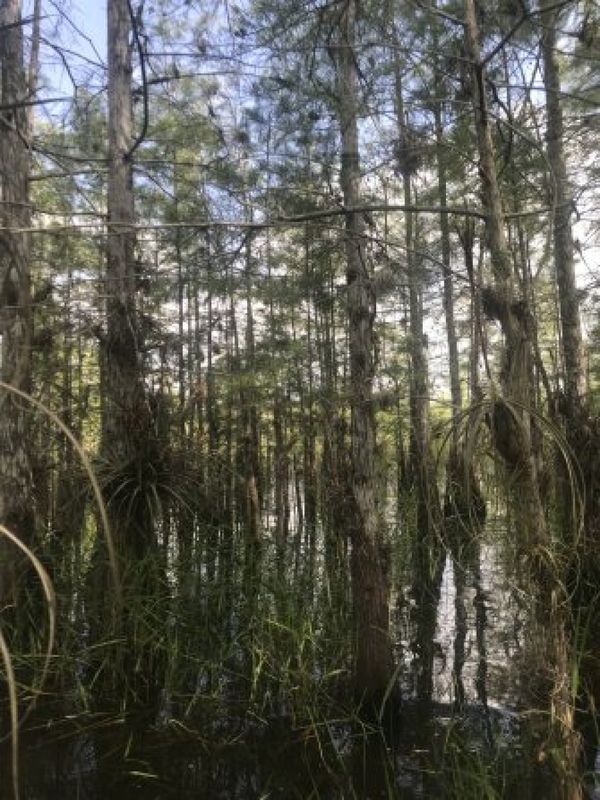 The trees in the center, closest to the alligator hole, tend to be the taller ones and as you move away from them, you start seeing shorter ones, thus, a cypress dome is created. In our slough slog, we started out in the sawgrass prairie outside of the dome where you can find periphyton. When you first look at periphyton it looks like poop or something close to that, but really it’s all algae, bacteria, and little tiny organisms. Three kingdom groups in tiny, sponge-like material. They help filter the water as well and retain it when it is the dry season so the things inside of it can continue to grow. Here we are popping our visitors’ slough slog cherry! Everyone seemed pretty excited after a couple of minutes because it was the hottest day and the water was actually really refreshing. We stopped for a while and Ranger Dylann gave a talk about periphyton and how the domes form. We gave everyone some time to adjust and become accustomed to the floor and being in the water. Once out of the sawgrass prairie, we moved into the cypress dome. We walked around and talked about the bromeliads (air plants), we found a butterfly orchid in bloom and a cigar orchid that seemed to be coming back to life after Hurricane Irma. 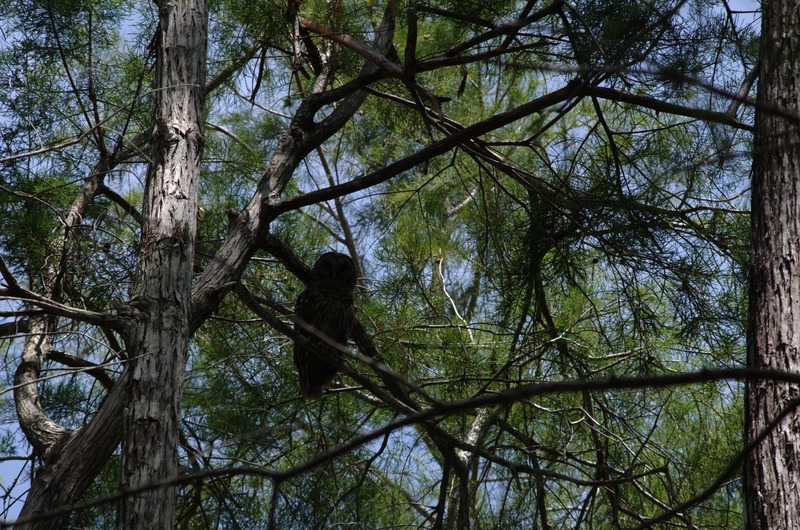 When we got deeper into the dome, one of our visitors, who apparently has an incredible eye for wildlife, found a barred owl on one of the cypress trees. We continued and stopped every once in a while to admire the silence inside the dome. 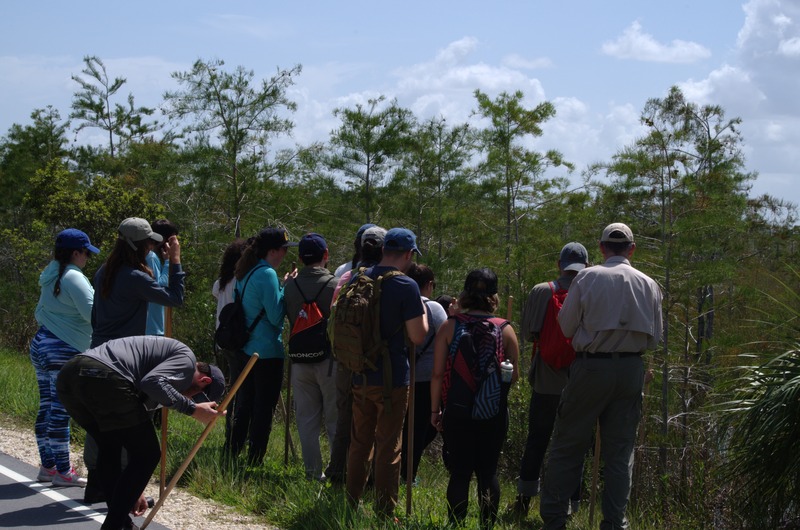 It was incredible to see other people, who love our National Parks and nature, enjoy something that to me has changed the way I see the Everglades. Since I have started my internship, I have now gone out to slough slog three times. Trust me, there will plenty of other times. If anyone out there lives near the Everglades and is tired of the same trails, go past the Pa-hay-okee Overlook Trail and go into a cypress dome. Of course, if you are going to do this, don’t forget to let someone at the visitor center know. It was so awesome to see so many young Latinos come out and want to try something new. Everyone was so trusting of us and just went right into the prairie, no questions asked. Sure it was the hottest day to this day, but everyone forgot about that the second we stepped foot in the dome. We also had a super special guest at our event: John Morales. For those of you who are not aware of who John Morales is, he is the person who we, South Floridians, watch for out weather. He is the one we watch during hurricane season. He is the senior meteorologist at NBC 6/Telemundo. He is honestly one of my greatest inspirations. Like everyone else, he seemed to enjoy the experience, even dropping pins whenever we would stop so he could bring some friends on another day. I really hope this event won’t be a one-time thing and that our local national park won’t forget that the majority of the population around it is made up of Latinos. Even though I won’t be with the park after my internship, until I graduate maybe, I want to leave an impact. I want the park to create a program where they do outreach for students my age who are mainly Latinos and have never been anywhere near the Everglades. I want everyone to come out and do something they would never do on their own. I want everyone to experience the Everglades the way that I have been able to this summer. Visit your closest National Park. Be one with nature.